This is a simple trick, useful for cleanly implementing GUIs where the memory availability varies across different layers. A common pattern is for there to be a Coherence Cache that contains a data and a GUI will require some subset of that data. Individual screens further require filtration. Chaining CQCs is a simple and elegant way of doing this as it lets you decide, through config, where each CQC will reside. Taking the rich client example you might request all trades for a desk be sent to the client (this analogy works equally well for a webserver process). This can be implemented as a CQC selecting all trades in a desk. A trader then applies a subsequent filter to his blotter to restrict it to only three books. If you implement this as a further CQC, run on the current CQC it will apply the filtering for you (the objects will not be duplicated but the matching keys will). The nice thing about this pattern is that where you place each CQC (in the client/webserver or on the cache itself) is up to you and you can thus easily tailor it according to the memory availability of each layer /latency requirements. Moving them around is just config. Credit to Damian Guy / Jon Knight for coming up with this neat idea. This is a very simple pattern that can be used to solve a variety of problems. 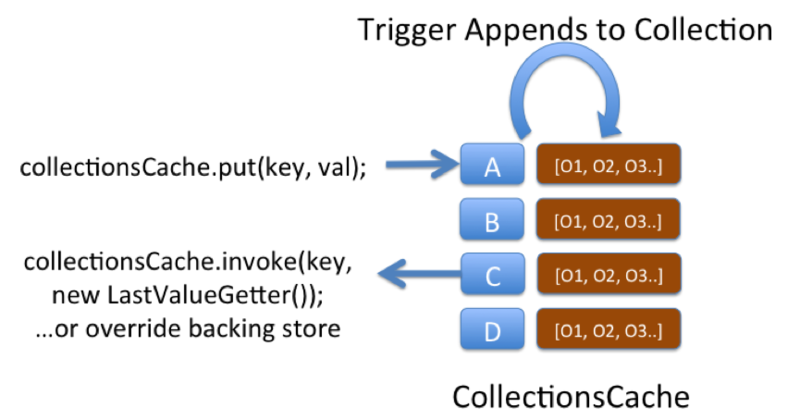 The structure uses a “Collections Cache”: a cache that appends values to a collection using a Trigger. You can then access the entire collection using a get() or alternatively use an EntryProcessor to extract a certain value from the collection. The pattern is used on ODC to track aggregate views. 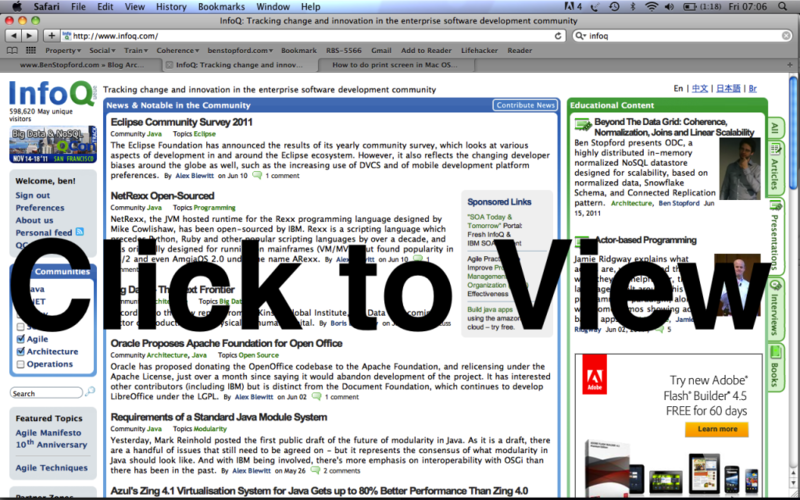 Say you want a materialised view of trades grouped by book. We keep a reverse index of trade references for each book. The view is updated asynchronously as data is added to the cache using an async CacheStore. The pattern is applicable to a variety of other use cases, one being an approach to managing version history. One downside of this pattern is that if the concept is not well known it can be confusing, after all the object you put() is not the same type as is returned from a get(). Simple naming as collections* can help avoid this confusion though. I like triggers in Coherence. They allow us to do lots of cool stuff to our objects as we add them to the cache. Implement versioning, stamp them with cluster time, save them to a messaging system, check for duplicate writes, check for concurrent writes … the list goes on. But with all this processing comes the risk of failure and Coherence provides little in the way of exception reporting. In fact it provides no information on the individual failures, something that quickly becomes a problem as the level of trigger functionality increases. On ODC this caused us a real problem so we re-implemented putAll() so that it correctly reported those writes that failed. Credit goes to Jonathan Knight and Andrew Wilson for working this implementation through. The pattern is pretty simple at a high level. It involves two Invocables. The first simply executes on the extend proxy, as we need to be inside the cluster to get access to the key assignment strategy. The next step is to split the data being written into the subsets applicable to each node using getKeyOwner(). These subsets are then sent, via a second Invocable, to the members that own them and EntryProcessors are used to do the write to the backing map directly (although this is no longer needed in 3.7). This is shown pictorially below. If you’ve hit this page you are probably thinking about adding joins to your Coherence cache. In general this is not a good idea. If your cache is that, a cache, you can use the aggregate pattern to solve most problems. Joins are complex and do at cost at runtime so only add them if you need them. However they can be very useful in some circumstances. Why do you need joins, why not just use aggregates? You need joins if you can’t aggregate all of your data into one object in the cache. If your data is mastered in a separate database it is unlikely that you will need more than the aggregate pattern. You only need joins if Coherence is being used as the System of Record or entry point to the system. If you are using the cache-aside pattern it is unlikely that you will need joins. Data arrives from different sources directly into the cache so it is desirable to versioned sources separately to accumulate individual histories and recombine at runtime. 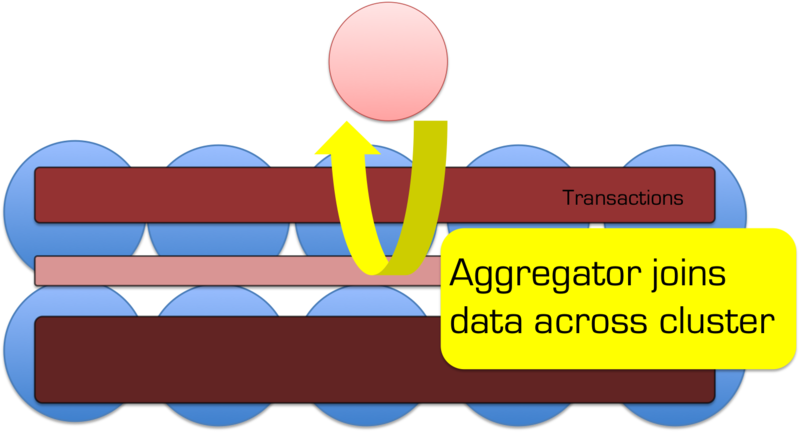 Aggregates become overly weighty and a majority of requests don’t need the full aggregate so it is desirable to join at query time according to the user’s preference (there are other ways around this problem though including different aggregates as well as decomposing the aggregate on read). Assuming you have one of the above use cases we’ll discuss how joins can be very useful. The approach described here is the one taken on ODC at RBS. This is a project started in 2009 to build a centralised trade and reference data store in a bank. This use case is for a store, rather than a cache. In it Coherence plays the role of entry point to the system, hence joins are required to version independent histories and apply snapshotting. Holding objects in a aggregate (denormalised) form leads to the problem of how you keep all that denormalised data consistent. Data must be duplicated and this both eats memory (and much more so if you implement versioning) as well as making it very hard to implement any kind of consistency across all those copies. To get around this we use an approach which looks like (but is subtly different from) the Star-Schema approach used in data warehousing. Entities are denoted facts or dimensions where a fact is a big thing that needs to partitioned accross the grid and an dimension is a smaller thing that we can afford to replicate in our query processing layer as there are simply not that many of them. 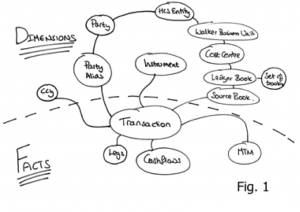 In fact we take this model a step further my tracking the arcs on our domain model and only replicating those that are ‘connected’… but more on that later (see here). 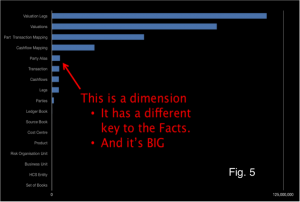 In this context: Facts are defined as big objects that require partitioning, Dimensions are smaller objects with cross-cutting keys that will be replicated. In Coherence we split the application architecture into two layers: The Query Layer and the Data Layer. Dimensions are cached in Continuous Query Caches in the Query layer and the Facts are spread across the Coherence cluster. Related Facts can be joined in-process as Key Affinity is used to ensure collocation (i.e. they are partitioned with the same key and Coherence uses the key to determine which partition they should go in). Dimensions are replicated onto the Extend Proxies using CQC’s and the joins are done at the start and end of queries using dictionary lookups. 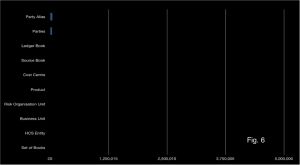 All dimensions are checked, in process, via the same CQCs used to speed up the 2-stage query. This has an unfortunate consequence: Changing a dimension will result in CQCs being updated across the cluster via one-phase commit. This presents a potential threat to atomaticity and isolation since the changing dimension will be incoherent across multiple JVMs during the one-phase commit. Fortunately query isolation in such a model is still ensured, from our perspective, by making the simplifying assumption: consistency is only implemented within the context of requests to a single extend proxy. This is a manageable assumption. The application of what we denote the Connected-Replication Pattern further optimises the replication of Dimensions by ensuring that only Dimensions that are actively referenced from Facts are replicated – Dimensions are only replicated if they are actually connected to other parts of the domain model. By only replicating data that is connected to the object graph we, in practice, only replicate 10% of the Dimensions we store. This is a huge advantage. The context of the problem is any partitioned data store: one where data is spread across a number of machines. This approach was first suggested by Dewitt et al in the Gamma Database and popularised in the database community with the term Sharding. The Sharding approach has been extended in more recent technologies by partitioning both data and the responsibility for processing it in what is termed a Shared Nothing Architecture. In Shared Nothing each node is self-sufficient, each having autonomy over the data it holds and processes. It is this autonomy that allows data-stores following this pattern to scale linearly for some common query loads. Shared Nothing Architectures however come at a price. The partitioning model breaks down when queries require intermediary results to be shipped between machines, particularly where those intermediary results do not form part of the final result. Examples include joins between ‘Fact’ tables (where the join keys must be moved from one machine to another), multidimensional aggregations such as multi-dimensional risk calculations (i.e. the OLAP domain) or transactional writes that span the partitioning strategy. Fortunately, many modern use-cases, particularly in the OLTP space, have little requirement for complex joins that span large data sets. For these simpler use-cases queries can be compartmentalised on a single node via some common attribute that they all share (known as a partitioning key or Data Affinity in Oracle Coherence). For example access to data in an online banking application might group data pertaining to a certain user. By choosing the UserId as a partitioning key user-centric joins can be executed entirely a single node and hence will scale. The counter-example is queries that require lots of joins that cross the partitioning strategy. Extending our banking example, listing the details of accounts that a user can make payments into would mean accessing data associated with a different user. As the UserID is the partitioning key, account information for different users will be located in a different partition. This typically requires key shipping: A two-stage query which first returns the users details then scans the cluster for the various account details for other users: the payees. This example is trivial but it alludes to a much larger problem when queries must include many different data items that cross partitioning (and hence machine) boundaries. It is these complex queries, those that need to join across a variety of crosscutting keys. The connected replication pattern addresses this problem. There are three fundamental concepts that are used to optimise distributed data storage: Replication, Partitioning and Indexing. When it comes to data placement we have just the two: Replication and Partitioning – with our aim being to remove the need for cross-partition joins. The approach here is to split the aggregate data-model to pull out dimensions that you wish to version separately. This ends up looking a bit like Snowflake. The Snowflake-Schema is well known in the data-warehousing space but its application here is quite different as we use it to define what we replicate and what we partition. Take an object model such as that shown in Fig. 1. The dotted line represents the division between Facts and Dimensions. The line can only exist in one place: that being the point in the object model where it converges on a single entity – the focal point of one-to-many relationships. This focal point also identifies the most precise, commonly shared key among facts. Like the regular data warehousing application this can be described intuitively as Facts being the recorded fact, whilst dimensions represent the context that give that fact meaning. As an example let us consider a typical online shopping application, an Order would be a Fact whilst the Customer with which the Order is placed is a Dimension that provides the Order with ‘context’. This pattern is particularly applicable to distributed data storage as it provides a middle-ground between 3rd normal form, which presents too many joins for practical distributed applications and full denormalisation which presents a range of consistency issues when changes affect large numbers of denormalised entities (as well as proving problematic when objects need to be versioned). Snowflaking is important for tempering a version explosion (versioning of objects is important for MVCC, necessary in most non-trivial data stores). 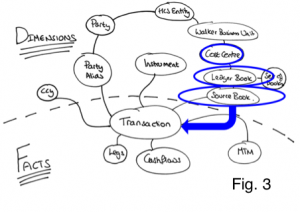 By holding sub entities separately they can be versioned independently meaning that a change in a sub entity, for example cashflows in the model in Fig. 3, does not necessitate a version increase on the other related objects: Transaction, MTM and Legs in this case. The alternative to this would be to hold all the data as a single Fact but any change would necessitate a new version of the whole group. This is version explosion is prohibitive when using in-memory architectures. So we have divided our data model into a Snowflake-Schema. However there is little novel to that. The value from doing so becomes evident when we use the two classifications of entities, Facts and Dimensions, to drive whether data is to be partitioned or replicated. 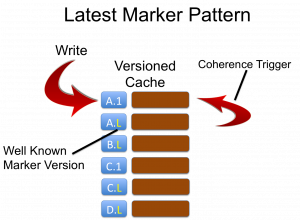 In this manner we are able to balance replication and partitioning so that no distributed, sequential join operations are required: joins where the key-set for one entity must be retrieved first from one set of machines followed by a second query to get related keys to complete the join from another entity, on another machine. Referring back to the at the object model in Figs. 1/3, to query transactions for the PartyAlias “City Group” where the Product is an “FX trade” we would first request the PartyAlias IDs for “City Group” (Stage 1 query), once that returned we would query for the product id for “FX trades” (Stage 2 query) and then finally we’d query for the Transactions that matched the keys for those PartyAlias’ and Products (Stage 3 query). It is this sequential set of distributed queries that affect performance. This problem is solved through the application of a Snowflake Schema so that Dimensions are replicated to the Query Layer that sits in front of the grid, whilst keeping the Facts partitioned in the grid itself (See Fig. 4). Queries still need to be sequential as described above, but importantly all the Dimension queries remain in process as the dimension data is replicated (there is no network call required) and hence the cost is minimised. As an example of this Fig. 3 shows a typical query in which the ‘where’ clause specifies a Cost Centre. Sequential queries must navigate their way down the object model until they reach the lowest dimension. In this case Source Book. Because these dimensions are replicated everywhere the calls are in-process and hence will be fast. The result is a set of IDs for this ‘lowest’ Dimension. These IDs are then used to query the Facts, which are held partitioned across the cluster. A distributed call is made to the grid to retrieve Facts. Fact and Sub-Fact joins are done, in-process, in the various partitions across the grid (as we know related Facts and Sub-Facts will be collocated in the same partition). This concept is not novel, the commercial databases Vertica, Greenplumb and other data warehousing products all make use of replicated data. However applying this pattern can be problematic. In-memory architectures are more constrained for storage than their disk-based brethren and replication is not a scalable storage pattern. This problem is addressed through the application of the Connected-Replication Pattern. 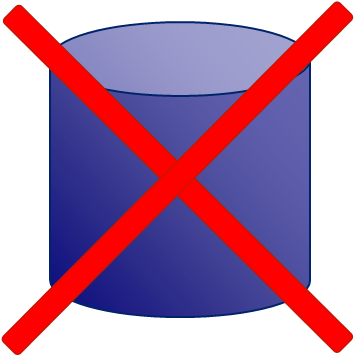 A reality of most commercial databases is that a large proportion of the data remains unused. This problem is highlighted by the work done around archiving in the database community. One recent study shows up to 80% of data in enterprise databases is no longer in use. The Connected Replication Pattern leverages this fact to reduce the amount of data that must be replicated by only replicating objects that are actively connected to Facts at any point in time. The growth of Dimension data is a problem when applying a Snowflake-Schema to achieve fast joins through the replication of Dimensions. The reality is that some Dimensions will inevitably be large. In fact the data set used above actually has includes some dimensions that are too large for replication. Fig. 5 includes that the Dimension “Party Alias” which is both very large and does not share the same key as the other Facts, so cannot be partitioned with them. Connected Replication tracks the links between Dimensions and Facts as data is written to the store. This acts like a real time archiving process ensuring only the absolute minimum number of dimensions are replicated i.e. only those currently connected to Facts. Fig. 6 shows the size of dimensions after applying the Connected-Replication pattern using the same scale as Fig. 5. 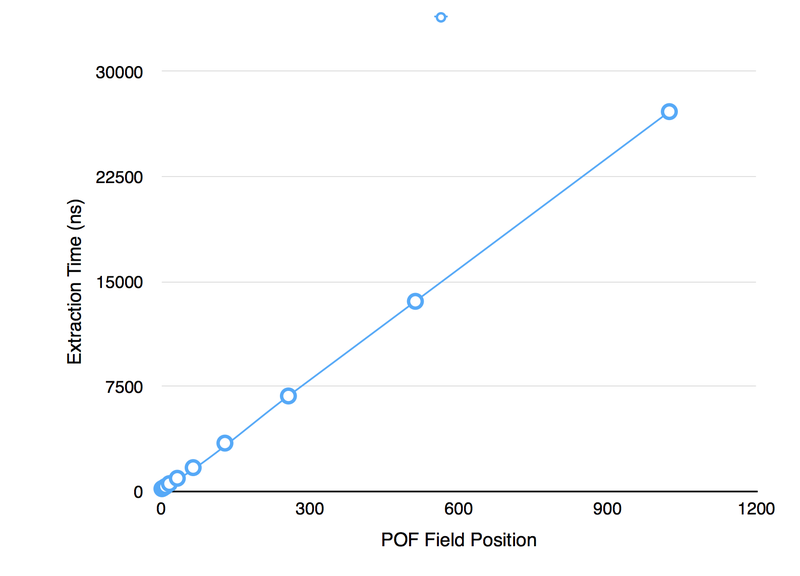 You can see there is more than an order of magnitude less data to replicate after Connected-Replication has been applied. 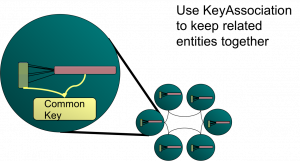 Under Connected-Replication, as data is written, a recursive process examines the relations between Dimensions and ensures that they are replicated. This is shown in the Fig. 7: A trade is written. It has three relations to PartyAlias, SourceBook and Ccy. A message is passed to the storage layer for each of these entities (the white lines) and if the Dimensions are not already replicated they are pushed into replicated storage in the Query Layer (the blue/yellow lines). This process recurses through all the arcs in the domain model until the Query Layer contains all “Connected-Dimensions”. The mechanism can be either immediately or eventually consistent. The former not surprisingly decreases write performance. An offline process prunes the connected caches of unused dimensions corresponding to data that has been removed. Hopefully you have seen that Connected-Replication provides a novel approach to balancing Replication and Partitioning so that joins can be done in-process whilst minimising the memory footprint. It is not necessary to have two layers. Replication could be added to all nodes in the grid (i.e. the two layers are folded together) but we find it preferable to hold them separately as the ODC has far more data nodes than it does query nodes (400 storage nodes are serviced by 40 query nodes). For our use case this provides a better use of memory. The underpinning of Shared Nothing data stores is that adding a machine to a cluster proportionally increases the amount of CPU, network bandwidth and storage available. This is, of course, a fact, however the statement is only really of value if the mechanism used for reading and writing data also scales linearly, with respect to each of these physical resources. 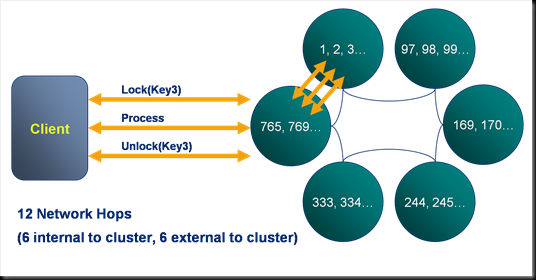 A typical Key-Value access pattern works well: store.put(key, val), store.get(key) scale linearly as the number of nodes in the cluster is increased. 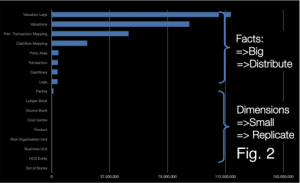 This scaling leverages the fact that data is sharded (spread) across the available machines. Any single read or write operation is simply routed to the machine that owns the partition i.e. only one machine is ever asked to service a single ‘get’. The problem is that, in real world use cases, ‘get’ and ‘put’ are often not enough and data stores offer richer query interfaces. This leads users to inevitably more complex access patterns that necessitate the use of queries that do not access data via the primary key. The rub is that these queries don’t scale in the same way. The implications for scalability are fairly obvious and noticeable when such stores are run at scale. What tends to happen in practice is that one physical resource forms the bottleneck. For high data-density systems this is often disk. 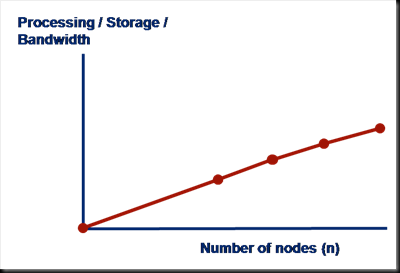 So if the disk in one machine can support 100 queries per second, that will be the limit of the system no matter how many nodes it has, at least where secondary indexes are used to drive queries in this broadcast way. However, if queries per second is a direct function of data volume per machine, then adding more machines will reduce the amount of data held on each. This increases the performance of the cluster by decreasing the amount of work each node needs to perform per query. Try to use key based access instead of queries wherever possible. Increase the cluster size so that the amount of data serviced by each node is reduced. This decreases the response time for each request and thus the overall load on each server. It is however somewhat expensive and wasteful. Another trick is to paginate the query over the available partitions. This doesn’t address the problem directly, rather it spreads each query over a longer time frame reducing the risk of load spikes. So be wary of overusing secondary indexes! How Fault Tolerant Is Coherence Really? Dessert Island Disks Top 3 reasons for using Coherence have to be: Speed, Scalability and Fault Tolerance. When designing systems with Coherence it’s easy to get carried away with the latter, especially when you start to embed your own services and leverage the implicit fault tolerance. But in all this excitement I’ve often found myself overlooking what the guarantees really are. 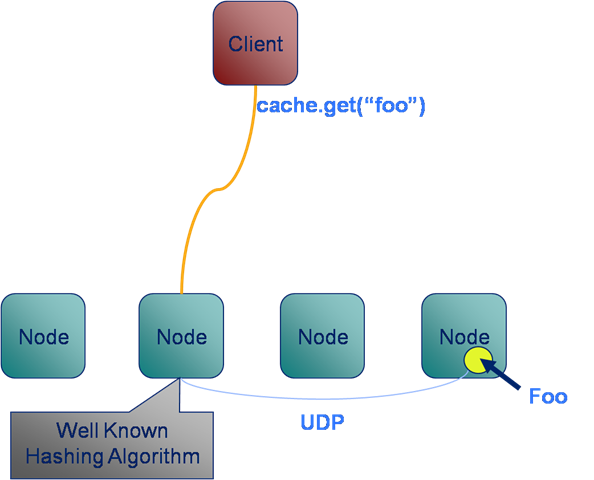 Most people know that Coherence backs up your data on another node so that if one process is lost it can be restored (see diagram). They also may know that the number of backups Coherence takes, for each piece of data you store, is configurable. However it takes a little consideration to become totally clear on what guarentees of fault tollerance Coherence really provides, hence my summary here. How many machines failures can occur simultaneously without the cluster loosing data? What is the maximum reduction in cluster size under which the cluster can operate without data loss? These two aspects of fault tolerance seem quite similar at first glance but they are driven from very different aspects of the technology. The first refers to concurrent loss of hardware. After a machine is lost Coherence will redistribute backups on the remaining hardware so that every partition has a backup somewhere else. The first question above arises where a second machine is lost before this redistribution phase has had an opportunity to run. The second question is to do with physical resources, most commonly RAM. If you loose 1/3 of the machines in your cluster do you have enough memory on the rest of them to store a primary and backup copy for the data the lost machines were holding (currently Coherence will try to make a backup even if it means throwing an OutOfMemoryError – something I’m told is being addressed)? Physical memory tends to be the problem here as it is a hard limit (hit a CPU limit and you slow down, hit a memory limit and you get corruption) but hitting a CPU limit is probably equally likely on most clusters. The important point is that you size your cluster with this in mind. That’s to say that you include enough memory headroom for primary and backup copies of the data after the loss of some number of machines (An algorithm for sizing your cluster can be found here). Having done such analysis however, and I know many teams that do, it’s tempting to then think your cluster can survive the loss of 1/3 of it’s hardware (or whatever resource overhead they provisioned) because there is enough physical resource for Coherence to recover. This would be true if the loss of nodes were separated in time but not if they occurred simultaneously. The limit of Coherence’s fault tolerance is the loss of more than one physical machine in a cluster. Backup data is placed on a different host to the primary, where possible. Backups of the partitions in a single JVM are spread evenly over the cluster. The implication is that the loss of a single machine with be handled with the added benefit that the even distribution of backup data across the cluster makes redistribution events rapid (think BitTorrant). However the loss of a second machine will, most likely, cause data loss if some of the data from the first machine is backed up on the second. The cluster won’t loose much, but it will likely loose some. One suggestion for combating this is to increase the backup count. Unfortunately, in the current version, this doesn’t help. Coherence is really smart about how it places the first backup copy; putting it on a different machine where possible and spreading the backups evenly across the cluster. But when it comes to the second backup it is not so clever. The problem of backup placement is O(n), hence this restriction. As a result, configuring a second backup provides no extra guarantee that the second backup will be held on a different machine to the first, hence loss of two machines may still cause data loss (but the probability of this has been reduced). Luckily there is light at the end of the tunnel. The Coherence team are working on smarter tertiary backups, or so I’m told. If you’ve been using Coherence for a while (or any other distributed cache service like Gigaspaces or Gemstone) you may well have had that wonderful ‘penny dropping’ moment when considering the collocation of data and processing. Suddenly you can perceive architectures where you no longer need to move all that data around before operating on it. Your grid already has it there at your disposal. As a toy example lets conside r pricing a large portfolio of trades. The pricing algorithm would require trade and market data as input, but as these are logically distinct entities you are likely to store each in a different cache. But for efficiency you’ll need the data for the corresponding trade and the market data on the same node, so that wire calls to collocate them don’t need to be made prior to pricing. Coherence gives you a great way to do this: Affinity instructs Coherence to store data in a certain way, that is to say it is grouped together so that all data items with the same ‘affinity key’ are kept together (see figures). Thinking along these lines you’d think we might have solved our pricing problem. 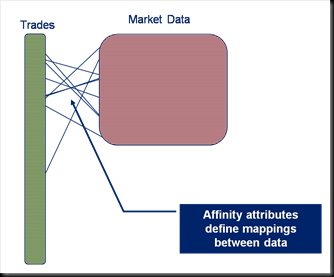 We can use affinity to keep the trade and m arket data together. As it happens this does work (depending somewhat on your data distribution). However it all falls to bits when you need to perform the processing to price the trade. The problem is that you want to wrap the processing in a Coherence function that is ‘data aware’. Most likely an Aggretator or possibly an Entry Processor. The reasoning being this is that these functions will automatically route themselves to the nodes where the data resides. The alternative approach is to use an invocable, but this is not data aware so you have to write extra code to route each request to the correct node (perfectly possible but not the most elegant or efficient solution). So persisting with the data-aware functions as a wrapper for our pricing algorithm, lets say an Aggregator, you would quickly hit a problem with the way that Coherence is architected internally. Aggregators run inside the Cache Service (i.e. 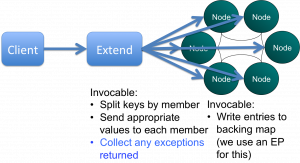 the service that manages data in Coherence) and the Cache Service threading model does not permit re-enterant calls . So what does that mean? 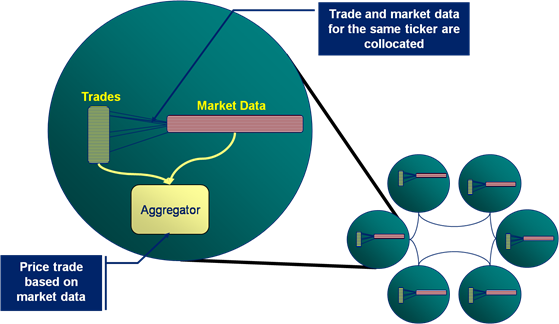 It means that, if you ran your Aggregator against the trades cache, you would not be able to call out from that Aggregator into the Market Data cache to get the data you require to price the trade. Such a call would ultimately cause a deadlock. The diagram demonstrates the CacheService threading model under a simulated deadlock. 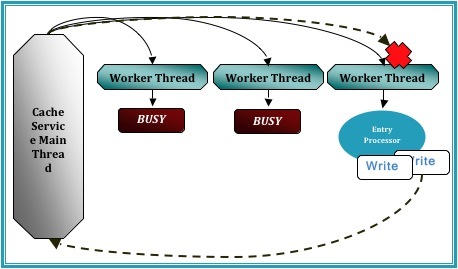 Even when the Cache service is configured with a thread pool there is the possibility that a re-entrant call will be scheduled back to the worker thread that is making that call, particularly in the case where the thread pool is small and the EntryProcessor workload is long. A work around for this problem is to place the parent cache (or more precisely, the cache against which the Entry Processor or Aggregator is run) in a different Cache Service to the cache that the function is operating on. By splitting into at least two Cache Services the call to the ‘other’ cache will enter via a different Main thread to which invoked the Aggregator that you are currently running. This removes the possibility of deadlock. However, for our use case, spitting the market data cache and trades cache into different cache services is not an option as it breaks Affinity. 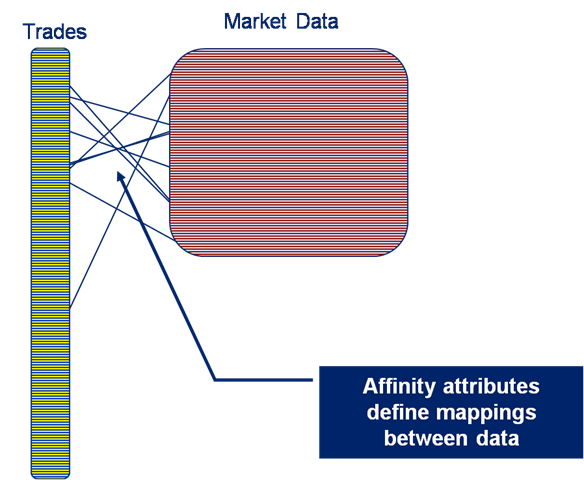 The data items will no longer collocate (as affinity is based on the hashing algorithm Coherence uses to store data, and that algorithm is at a cache service level). So how do you solve this problem. Well you have two options. As mentioned earlier you wrap your request in an invocable (which does not have the same threading issues as it runs in the Invocation Service) and route it to the correct machine yourself. This is described in the final diagram. As to which is best to do. Well I guess that depends how risk averse you are 😉 but for what it’s worth I use the former. A lot of people start using Oracle Coherence as a distributed cache because they need to get away from a data-bottlenecking problem. Many of open source NoSQL stores will help you with this problem too (if all you need is to stream large data volumes, being solely in memory is unlikely to be worth the additional hardware cost). However there are some big advantages to being entirely in memory. Distributed execution occurs next to the data it needs to operate on, either on request or as a result of some state change (think trigger), and this is a very powerful tool. This can lead to one of those ‘penny-dropping moment’ as the potential of merging data and processing, particularly in a wholly in-memory architecture, begins to unfold. The benefits or moving computation to data have been around for a very long time – stored procedures being the classic example. The possibilities are extended significantly when the processing space is actually a distributed data grid, with all logic executing in the same language (in this case Java) and with data represented hierarchically (as objects) rather relationally. Suddenly a whole world of fast distributed processing on collocated data opens up. Interestingly this is one of the main drivers for MapReduce (e.g. Hadoop): deal with very large data sets in a simple (albeit somewhat brute-force) way, collocating data and processing (although in Hadoop’s case it’s disk based) to allow processing to scale to peta- or exabytes. This same pattern can be applied in Coherence but with a slightly different as the goal: extending your application tier to allow real time processing in virtual address space that can grow to terabytes. The process of Merging Data and Processing is not seamless. The details of this are covered in another post. This article is meant solely as an introduction. There are in fact databases with exactly the same benefits, with respect to merging data and processing. VoltDB is closest (solely in memory, Java stored procedures) but there are many other shared nothing DBs that have impressive performance. Exasol and Paraccel are two worthy of note. 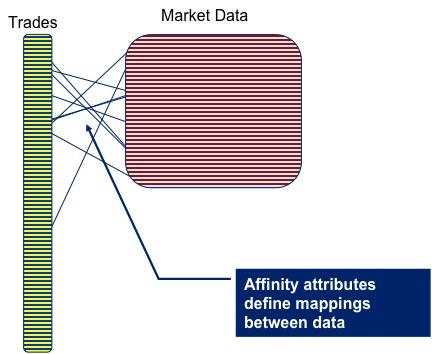 Data affinity allows associations to be set up between data in different caches so that the associated data objects in the two different caches are collocated on the same machine. In the example here trade data and market data are linked via the ticker meaning that all trades for ticker ATT will be stored on the same machine as the ATT market data. Thus when an Entry Processor or Aggregator executes, say to run a trade pricing routine, it can access the trade and its market data without having to make a wire call as the market data for that particular trade will be held on the same machine (whenever possible). This presents the possibility of folding the classic service-centric approach in two. Suddenly compute architectures can be merged into one layer that has responsibility for compute and data. The fundamental advantage being that far less data needs to be transmitted across the wire. 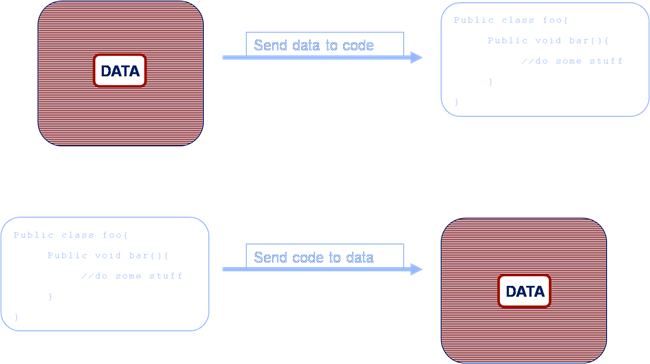 In a standard architecture (the upper example) data is retrieved from a data source and sent to the application tier for processing. However in the Coherence Application-Centric approach (the lower example) the code is sent to the machine that holds the data for execution. This is one of the real penny-dropping concepts that can revolutionise a systems performance. But it is important to note that Coherence is not a direct substitute for a compute grid such as DataSynapse. Application-Centric Coherence involves leveraging in the inherent distribution Coherence provides as well as its inherent collocation of processing and data. A feed server enters a trade into the Trade cache using an Entry Processor to execute some pre-processing. This in turn fires a CacheStore which reliably executes some domain processing for that trade on the same machine. 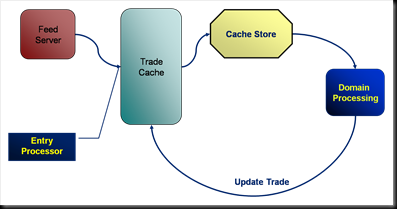 The domain processing results in the trade being updated in the cache. This is just one sample pattern, there are many others. Simply using Aggregators (thing MapReduce) distribute work to collocated data on the grid is a powerful pattern in it’s own right. All these patterns share the ability to collocate domain processing in a Java across a large, distributed address space. This means that not only is the execution collocated with the data but the executions are implicitly load balanced across the Coherence cluster. The ability to collocate data and processing. Service-Centric and Application-Centric are terms coined by Lewis Foti to describe the two broad architectural styles used to build Coherence based systems. Service-Centric architectures use Coherence simply as a data repository. Application-Centric users use Coherence as a framework for building event based distributed systems. Such systems leverage the inherent distribution and fault tolerance that comes with the product with operations being generally collocated with the data they require. This merges the Application and Data layers of the system. All client processes can configure a near cache that sits “in process”. This cache provides an in-process repository of values recently requested. 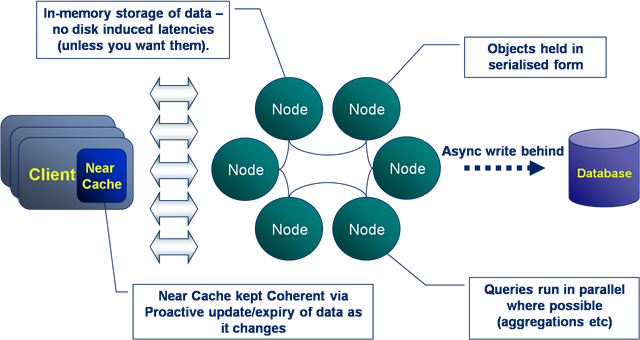 Coherence takes responsibility for keeping the data in each near cache coherent. Thus in the example shown here Client A requests key1 from the cluster. This is returned and the key-value pair are stored in the client’s in-process near cache. Next Client B writes a new value to key1 from a different process. 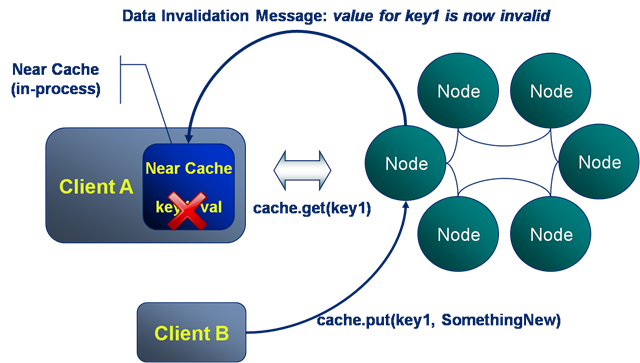 Coherence messages all other clients that have the value near cached notifying them that the value for key1 has changed. Note that this is dynamic invalidation, the new value is not passed in the message. Should Client A make a subsequent request for key1 this will fall through to the server to retrieve the latest value. Thus Near Caching is a great way to store data which may be needed again by a client process. 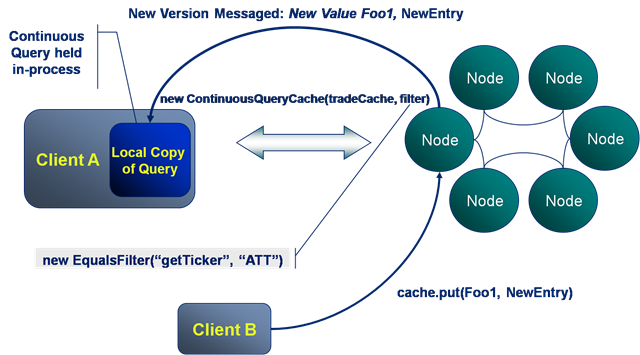 Client A initialises a ContinuousQueryCache using a filter that defines a subset of the entries in the cache, in this case all trades with the ticker “ATT”. The resulting dataset is held locally in the client’s process. Next Client B writes a value which is included in Client A’s continuous query. 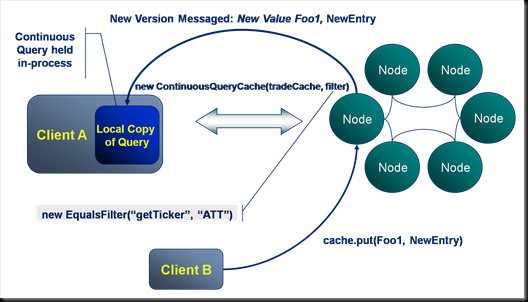 The cluster runs the continuous query filter against Client B’s write (if it is new) and determines its relevance to Client A’s continuous query. It messages both the key and value back to Client A, updating its locally cached copy with the new value. A trading blotter containing trades for a certain trader/book. Ticking prices for a certain Currency. 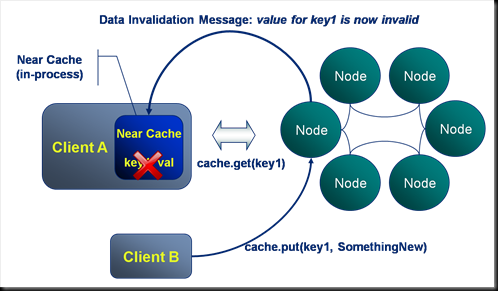 Thus in summary near caches receive invalidations only, with subsequent requests falling through to the server to get the changed data. Conversely continuous queries receive updates containing all new and changed data. So when might you use each of these? Use near caches by default for cases where there is likely to be reuse. Use continuous queries when it is known that all changes to a certain data set will be relevant to clients. 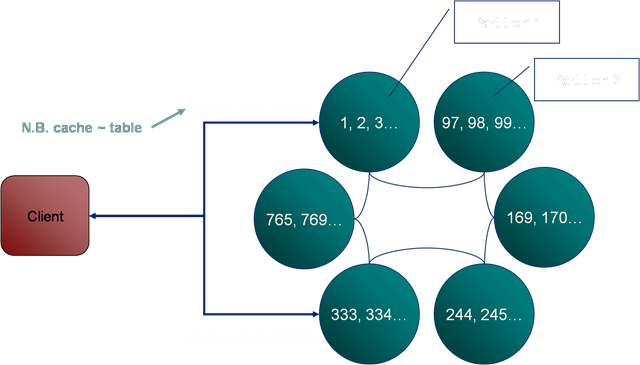 The cache types, Partitioned, Replicated and Near all support expiration policies for removing entries automatically from the cache. There are a set of basic expiration policies such as Most Recently Used, Least Frequently Used etc. Custom expiration policies, written in Java, can also be defined. In the example here a client has a near cache configured to keep the most recent 1000 tuples. The partitioned backing cache on the server has a different expiration policy set that expires entries once they reach a certain age. Indexes: Not So Much About Lookup Speed As Avoiding Deserialisation. Coherence allows the addition of indexes to speed up access to objects via attributes other than the key of the HashMap. 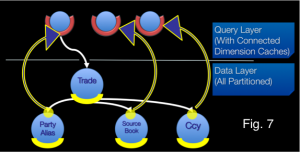 In the example here the Trade cache, which is keyed by Trade ID has an additional index added to the counterparties method on the trade object. Also note that, in this case, the counterparties method returns multiple values so the resulting index contains more entries than the cache itself. Queries performed against a key can be directed straight to the node that the key is stored on via the well known hashing algorithm. Index queries however must be sent to all nodes. Although this is done in parallel the transaction must wait for the all responses. Keys are unique. Indexes in Coherence solve the general case (any cardinality) and as such are less efficient. However the real boon of Coherence indexes is that in creating an index Coherence deserialises the object and caches the deserialised index key. Thus when computing the query each object does not need to be deserialised to look for a match. They execute on the machine that the key is located on. They execute synchronously with respect to that key (i.e. the key is write-locked during the execution of the Entry Processor). They code they run has full access to the key and entry. 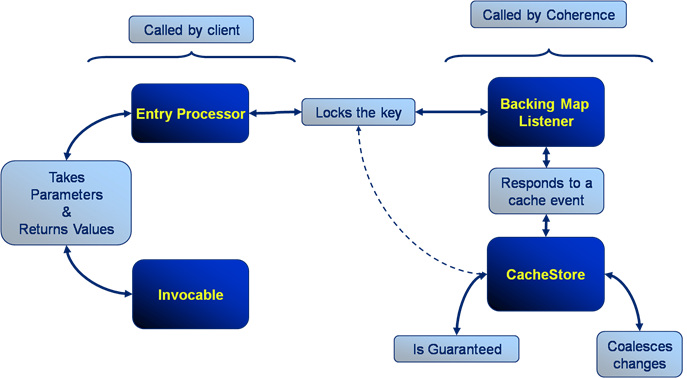 In this example the client invokes an Entry Processor against a specific key in the cache. A serialised version of the entry processor is passed from the client to the cluster. 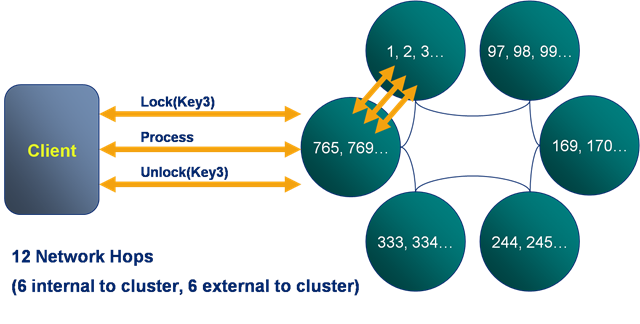 The cluster locks the key and executes the passed Entry Processor code. 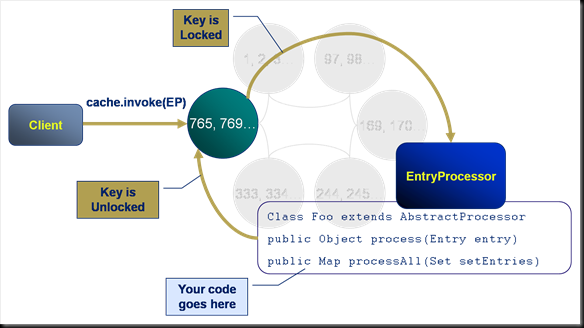 The Entry Processor performs the set of actions defined in the process() method. The cluster unlocks the key. Thus an arbitrary piece of code is run against a key on the server. Here we see an example of an entry processor, the ValueChangingEntryProcessor which updates the value associated with a certain key. Note that in contrast to the locking example described on a previous slide, this execution involves only 4 rather than 12 network hops. 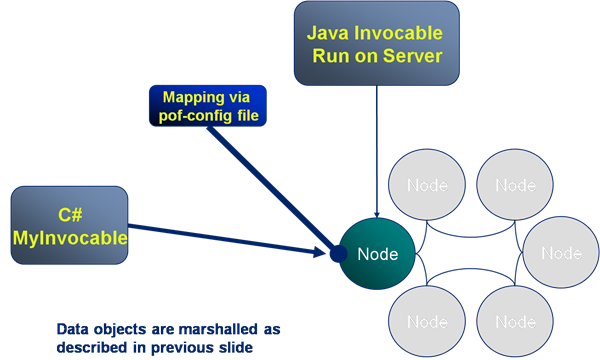 Invocables are the second of the four primary constructs and are analogous to a DataSynapse grid task in that they allow an arbitrary piece of code to be run on the server. Invocables are similar to Entry Processors except that they are not associated with any particular key. As such they can be defined to run against a single machine or across the whole cluster. 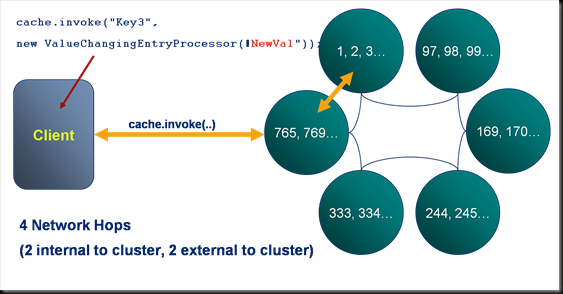 In the example here an Invocable is used to invoke a garbage collection on all nodes on the cluster. Other good examples of the use of Invocables are the bulk loading of data, with Invocables being used to parallelise the execution across the available machines. Triggers are the third of the four primary constructs and are analogous to triggers in a database. In the example here the client writes a tuple to the cache and in response to this event a Trigger fires, executing some user defined code. The code is executed synchronously, that is to say that the key is locked for the duration of the execution. The last of the four primary constructs is the CacheStore. CacheStores are usually used to persist data to a database and contain built in retry logic should an exception be thrown during their execution. The client writes a tuple to the cache. This event causes a CacheStore to fire in an attempt to persist the tuple. Note that this may be executed synchronously or asynchronously. In this case the user defined code in the CacheStore throws an throws an exception. The CacheStore catches the exception and adds the store event to a retry queue. A defined period of time later the cache store is called again. This time the execution succeeds and the tuple is written to the database. The retry queue is fault tolerant. So long as the cluster is up it will continue to retry store events until they succeed. Should multiple values be received for the same key during the write delay of an asynchronous CacheStore the values will be coalesced, that is to say that only the most recent tuple will be persisted. This coalescing also applies to the retry queue. Both Entry Processors and Invocables are called from the client but run on the server. They both except parameters during construction and can return values after their execution. Triggers/BackingMapListeners and CacheStores both run on the cluster in response to cache events. 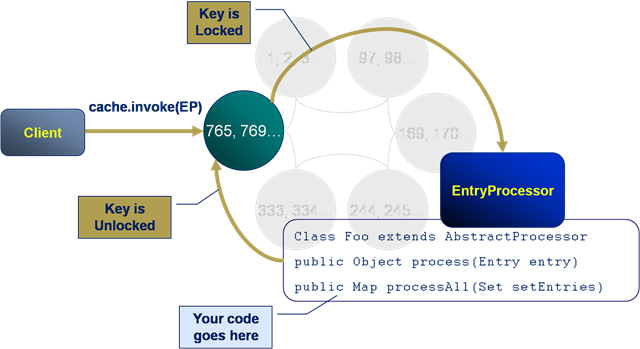 Triggers/BackingMapListeners, like Entry Processors, lock on the key for which they are executing. 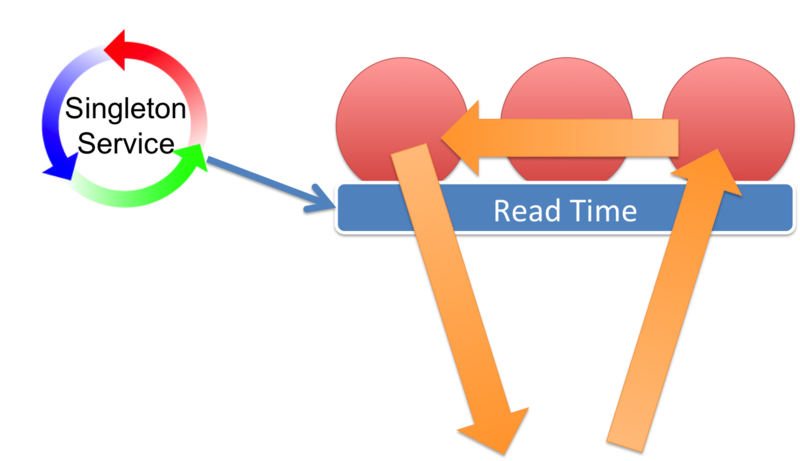 Synchronous cache stores also lock but their use in asynchronous mode tends to be more common. Cache stores are guaranteed, in that they will retry should execution fail and this retry logic is fault tolerant (it will retry on a different machine should the one it is running on fail). They also coalesce changes. Although Oracle Coherence may have a simple interface, behind it lies a some pretty cool tech. 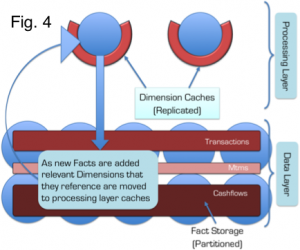 The heart of Coherence’s primary storage unit, the distributed cache, is it’s data partitioning algorithm. This is analogous to Horizontal Partitioning or Sharding in database terminology. 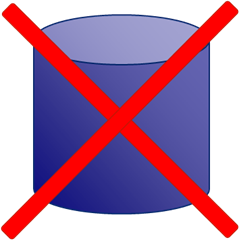 Vertical partitioning is the corollary of Horizontal partitioning, where database tables are split, by columns, into different tables (this process being called Normalisation). 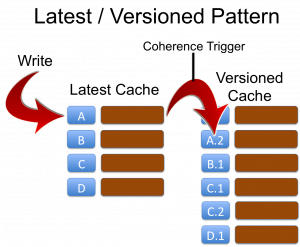 In Horizontal Partitioning tables are broken up into sets of rows through a partitioning algorithm, usually defined by the user. This the the fundamental concept behind any partitioned database (such as RAC or Terradata). Unlike some simple clustered data repositories, which rely on copies of the dataset being held on each machine, Coherence spreads its data across the cluster using a Horizontal Partitioning strategy based on a hash its key. Thus each machine is responsible for its own portion of the data set. Thus, in the example seen below, the user requests the key “2” from the cache (note that a cache is analogous to a table in a database, it is single HashMap instance). The query for key “2” is directed to the single machine on which the data resides. In this case the node in the top left corner. A subsequent request for key “334” is routed to the machine in the bottom left corner as it is this machine which is responsible for that key. Although the main storage mode is the partitioned cache, where the data is distributed across all machines in the cluster. It also supports the simpler case of the replicated cache, where each node has its own copy of the entire data set. So when do you think a replicated cache might be the appropriate choice? Use a partitioned cache for general data storage. Use a replicated cache for fairly low volume, static data that needs to be used “in process” on the server. Lets look at what happens during a simple data retrieval operation. 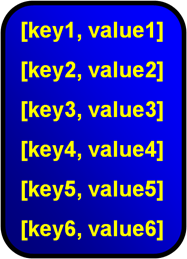 Here the client invokes a “get” operation to retrieve the value for the key:Key1. The request is directed to a connection proxy on the server. This manages the connection as well as forwarding the request on to the machine which it knows contains the key: Key1. It does this via the “Well known hashing algorithm”. The Well Known Hashing Algorithm is the algorithm used to determine on which machine each hash bucket will be stored. This algorithm is distributed to all members of the cluster, hence “well known”. This has the effect that the location of all keys are known to all nodes. Now looking at writing data to the cluster, the format is similar to gets with the put travelling through a connection proxy which locates the data to be written and forwards on the write. The difference is that writes must also be written to the backup copy which will exist on a different machine. This adds two extra network hops to the transaction. Coherence uses different protocols to communicate between different services. Client connect to via a TCP/IP based protocol called TCP*Extend. Cluster members use multicast based messaging to discover new cluster members and to heartbeat. Cluster members use a custom protocol, built on top of UDP for reliable communication within the cluster. As a result the protocol management usually performed in layers above the Transport layer of the network stack – most notably packet ordering and reliable delivery – are managed by Coherence itself in the Java cache-server process. Coherence includes a clever mechanism for detecting and responding to node failure. In the example given here node X suffers a critical failure due to say a network outage or machine failure. The surrounding cluster members broadcast alerts stating that they have not heard from Node X for some period of time. If several nodes raise alerts about the same machine a group decision is made to orphan the lost node from the cluster. 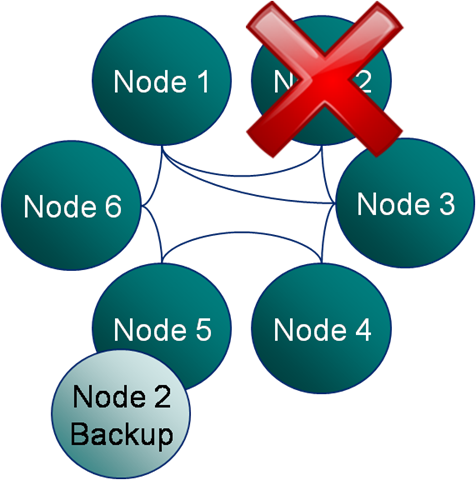 Once Node X has been removed from the cluster the backup of its data, seen here on the node to its left, is instantly promoted to being a Primary store. This is quickly followed by the redistribution of data around the cluster to fully backup all data and to ensure there is an even distribution across the cluster. The redistribution step is throttled to ensure it does not swamp cluster communication. However this step completes more quickly on larger clusters where less data must be redistributed to each node. Coherence has a propiatary object serialisation and communication protocal called PIF/POF standing for Portable Invocation Format and Portable Object Format respectively. POF is particuarly important as apart from being highly compressed (when compared to Java serialisation) it allows deserialisation into C++ and .NET Coherence clients. There is a detailed post on the internals of POF here. In the example the C# client defines the POF serialisation routine which is executed by the IPofSerialiser (written in C#) to create a POF object which is stored in the cluster. When a Java client requests the same object it is inflated with the PofSerialiser (written in Java) to create a comparable Java object. The previous slide covered the marshalling of data from one language to another. However non-Java clients also need to execute code on the cluster and, as the cluster is written in Java, any executions run there must also be in Java. To solve this problem server side code, such as the Invocable shown here, is mapped from a C# implementation on the client to a Java implementation on the server. Thus calling MyInvovable in C# will result in the Java version of MyInvocable being run on the server with the objects it uses being marshalled from one language to another via POF (as described in the previous slide). Extend Client: Connects to the cluster via TCP*Extend which is a protocol based on TCP-IP. This is the typical means for connecting to the cluster, is lightweight and scalable. 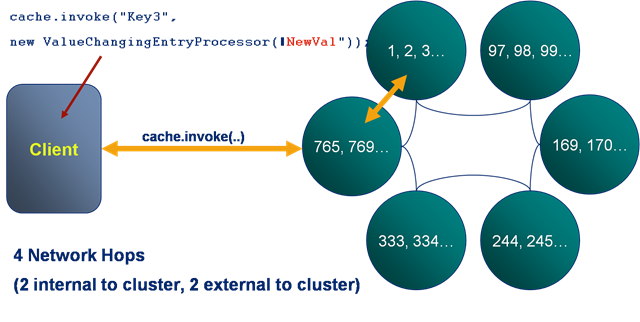 Compute Clients: These are cluster members running in a data-disabled mode. They are heavier processes needing tens of seconds to initialise as part of the cluster. However they are faster as they know the location of data (via the well known hashing algorithm). Monitoring of Coherence is done via inspection of the MBeans it publishes over JMX. JConsole tends to the be tool used to do this although there are a variety of other alternatives including RTView which presents a much richer interface onto the information Coherence produces. 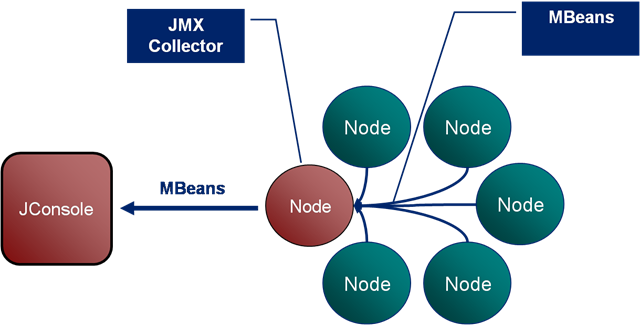 The Coherence JMX implementation includes Mbean publication from each cluster member which is collated via a singe nominated JMX Collector node. The JMX Collector makes all MBeans available to users via JMX. You can think of Coherence as simply being a distributed cache. It is after all what it was designed to do. But doing so would be something of an injustice. If a caching layer is all you need there are probably cheaper options. What you get with Coherence is a well thought out, simple framework for dealing with distributed data. In one dimension it has moved towards the traditional database space, offering query functionality, indexing etc. In another it has encroached on the world of the application container by providing a framework for low latency, highly available, distributed systems in Java. It is its evolution into both of these, traditionally disparate, technology spaces that make it such a unique and useful product to use. 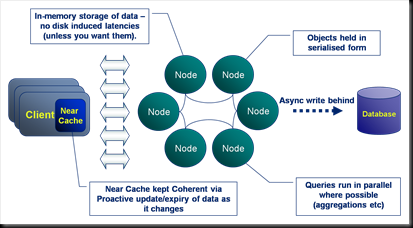 Coherence is still a traditional distributed cache under the covers, and is a pretty good one at that. So if you simply require fast access to prefabricated data (that is to say data that has been pre-processed into the required form), and you work in one of the 3 main languages (particularly Java), Coherence is still likely to be a decent choice, but there are quite a few cheaper alternatives these days, so bear that in mind. It’s also important to understand the limits of the technology and Coherence certainly has its limits (for example). A large proportion of Coherence’s performance and scalability gains come from it’s adoption of a shared nothing architecture (I’ve written more on shared nothing architectures here). This means it excels in certain situations and quite the opposite in others. Learning to use the technology is about learning its limits. It should be one of the many tools in your architectural toolbox, but a fantastic tool to have. Coherence is laid out over three distinct layers; client, cluster, persistence (see opening figure). 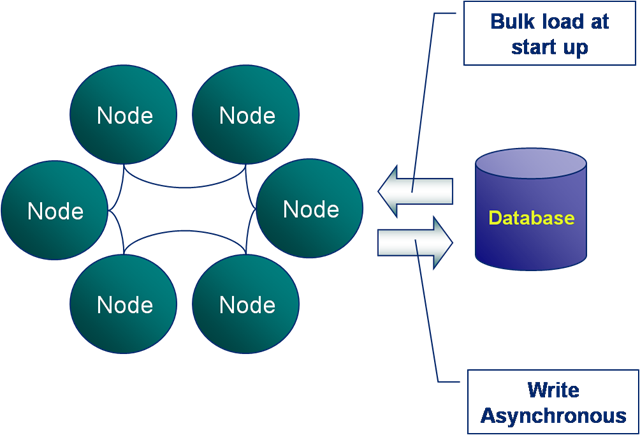 The Coherence cluster itself is sandwiched between the client on the left and the persistent data source on the right. The client has it’s own, in process, 2nd level cache. 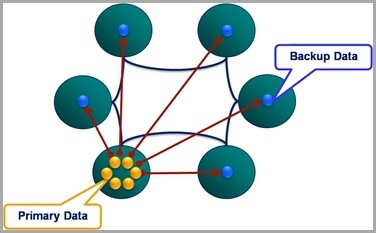 The persistent data source is usually only used for data writes, it does not contribute to data retrieval (as the cluster, in the centre of the diagram, will typically be pre-populated with data, but more on that later). It stores all data solely in memory. There is no need to go to disk. Objects are always held in their serialised form (using an efficient binary encoding named POF – find out more about this here). Holding data in a serialised form allows Coherence to skip the serialisation step on the server meaning that data requests only have one serialisation hit, occurring when they are deserialised on the client after a response. 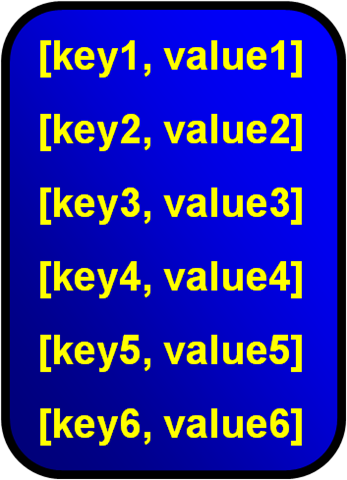 Note that both keys and values are held in their serialised form (and in fact the hash code has to be cached as a result of this). Writes to the database are usually performed asynchronously (this is configurable). Asynchronous persistence of data is desirable as it means Coherence does not have to wait for disk access on a potentially bottlenecked resource. As we’ll see later it also does some clever stuff to batch writes to persistent stores to make them more efficient. 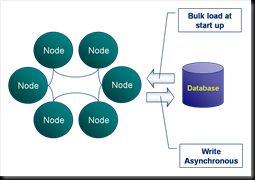 The result of asynchronous database access is that writes to the Coherence cluster are fast and will stay fast as the cluster scales. The downside being that data could be lost should a critical failure occur. As a result you should only use this asynchronous behaviour for data you don’t mind loosing. Queries use indexes which are sharded across the data grid. Thus queries follow a divide and conquer approach. Coherence is both fault tolerant and highly available. That is to say that the loss of a single machine will not significantly impact the operation of the cluster. 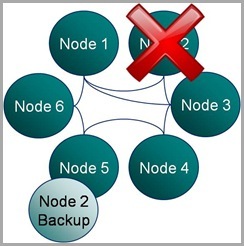 The reason for this resilience is that loss of a single node will result in a seamless failover to a backup copy held elsewhere in the cluster. All operations that were running on the node when it went down will also be re-executed elsewhere. It is worth emphasizing that this is one of the most powerful features of the product. Coherence will efficiently detect node loss and deal with it. It also deals with the addition of new nodes in the same seamless manor. Coherence holds data on only one machine (two if you include the backup). 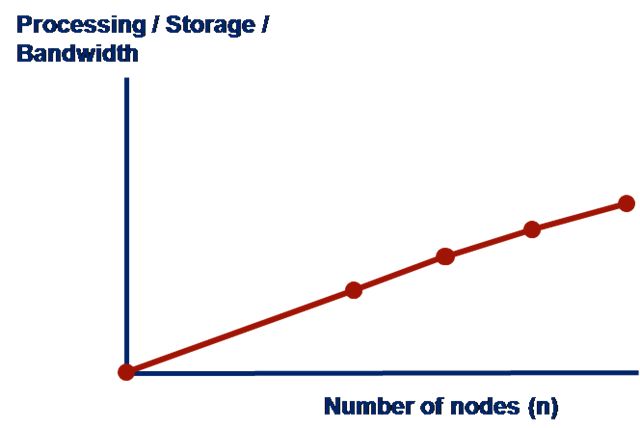 Thus adding new machines to the cluster increases the storage capacity by a factor of 1/n, where n is the number of nodes. CPU and bandwidth capacity will obviously be increased too as machines are added. This allows the cluster to scale linearly through the simple addition of commodity hardware. There is no need to buy bigger an bigger boxes. It should be noted that scalability only comes with key-based access. As noted previously (here) queries will not scale linearly as you increase the number of nodes. So we can summarise why Coherence is faster than traditional data repositories. Coherence works to a simpler contract. It is effic ient only for simple data access. As such it can do this one job quickly and scalably. Databases are constrained by the wealth of features they must implement. Most notably (from a latency perspective) ACID. High performance users are often happy to sacrifice ACID transactions for speed and scalability. So What Is Coherence Really? Most importantly, Coherence is just a map. All data is stored as key value pairs. It offers ‘some’ functionality that goes beyond this but it is still the fundamental structure of the product and hash based access to the key/value pairs it contains is fundamental to the way it works at the lowest level. In a typical installation Coherence will be prepopulated with data so that the cluster become the primary data source rather than just a caching layer sitting above it (Coherence offers both modes of operation, it just so happens that almost everyone I know does it this way). The main reason that ‘read through’ is not often used is that (i) it adds latency to early client transactions and (ii) the map contains in indeterminate quantity of data meaning that searches (queries) against the cache will return indeterminate results. Coherence is not a database. It is a much lighter-weight product designed for fast data retrieval operations. Databases provide a variety of additional functionality which Coherence does not support including ACID (Atomic, Consistent, Isolated and Durable), the joining of data in different caches (or tables) and all the features of the SQL language. * There is now (as of 3.6 I think) support for transactional caches. I’ve not used them to be honest and they have a number of restrictions. If you need transactions though you should probably look at alternative technologies. ** Coherence does support a simpler, object based query language but it is important to note that coherence does not lend itself to certain types of query, in particular large joins across multiple fact tables. There is now a newer declarative language option too. Now lets compare Coherence with some other prominent products in the Oracle suite. Firstly lets look at the relationship with Oracle RAC (Real Application Cluster). RAC is a clustered database technology. Being clustering it, like Coherence, is fault tolerant and highly available – that is to say that loss of a single machine will not significantly effect the running of the application. However, unlike Coherence, RAC is durable to almost any failure as data is persisted to (potentially several different) disks. However Coherence’s lack of disk access makes it significantly faster and thus the choice for many highly performant applications. Finally RAC supports SQL and thus can handle complex data processing. RAC however is limited by the fact that it is a Shared Disk Architecture, whereas Coherence is Shared Nothing (This difference is beyond the scope of this article but is discussed in full here). TimesTen is a totally different Oracle technology. It is a completely in-memory implementation of an Oracle database supporting most standard database functionality, but at much lower latency. The support for in memory storage is clearly a feature of both TimesTen and Coherence thus making them both suitable for low latency applications. However the big advantage of using Coherence is that it is distributed i.e. the data is spread across multiple machines. 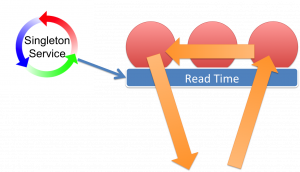 TimesTen is restricted to a single process and thus is neither highly available nor scalable beyond the confines of a single machine (although it can be configured for fault tolerance). This makes it the obvious choice if complex data processing is required or there is an existing dependence on SQL. The other comparable technological space is the Shared Nothing database. These are databases that share the same architectural style where each node has sole ownership of the data it holds. Such systems are currently used for a rather different use case; data warehousing as apposed to OLTP applications. However this is likely to change in the near future. You can find more discussion of Shared Nothing databases here. My SNDB of choice is ParAccel. Finally Coherence there are a number of other competitors out there which are pretty good. If you’re reading this today (I’m updating this in 2013) you should be checking out some of the open source alternatives. Hazlecast is the most obvious which now has a mature and well funded project that plays in the same product space. Gemfire, Terracotta and Gigaspaces are the direct competitors. If you are just looking for scalable caching layers with query semantics you might be better looking at a NoSQL disk based solution. These are much cheaper to run in the long term and keeping all your data in memory is often overkill if you are not operating on it directly. Check out MongoDB and Couchbase which are the two NoSQLs most closely related and both open source.